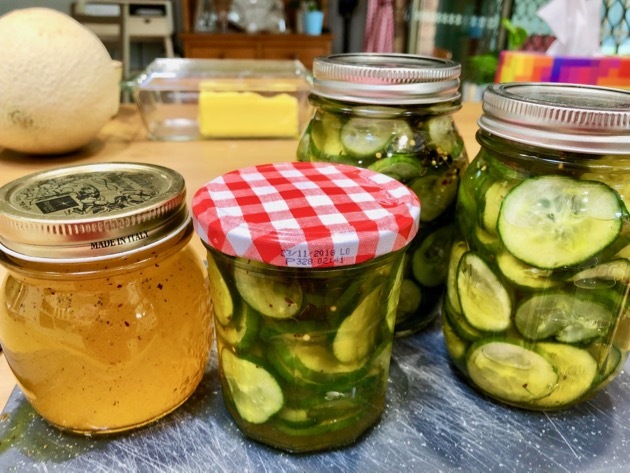 Preserving small amounts of fruit and vegetables is a good way to minimise food waste, cut the cost of providing interesting food and a good way to introduce new, delicious food to kitchen table. Of course, you could buy bread and butter cucumbers, tomato relish or a spicy chutney from the supermarket or local co-op but nothing will be as good as what you prepare in your own kitchen. You can make your preserves exactly to your taste. Here in Australia, we generally use UK methods of preserving which are different to those used in the US. If you're going to preserve more food, buy yourself a good preserving book as a guide. 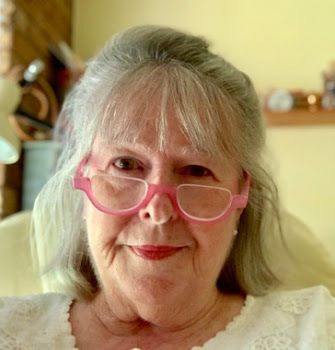 I use the Australian Women's Weekly preserving books, The River Cottage books and the WI book - Preserves by Carol Tennant, and read about salt, sugar, vinegar and safety before you dive right in. Make sure you work in a clean kitchen, clean sink, clean hands, clean utensils. Wash and dry the jars and lids you intend to use. I had 1 kg (2.2lbs) cucumbers so I prepared 4 jars. I thought I might use three jars but had an extra one just in case I was wrong. If you don't use your spare jar, you can store any leftover pickling liquid in it to use in salads. You don't need any fancy equipment to start preserving. When all our grandmas and great grandmas made jam, relish or pickles, they used what they had at hand and usually that was recycled jars and a saucepan. 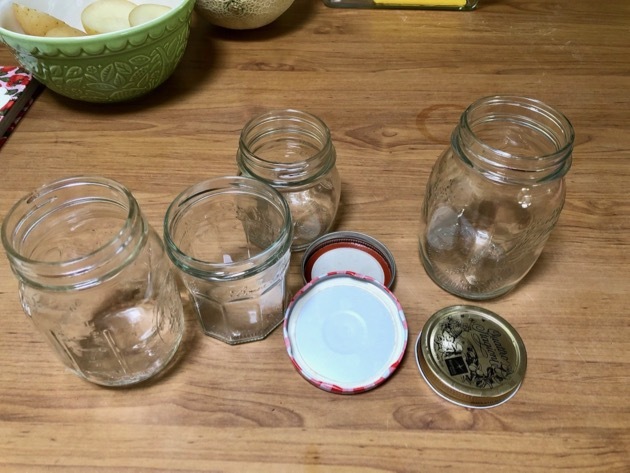 When you have your jars, look under the lids to make sure there's no rust, pin holes or damage and the rubber ring on the inside of the lid is in perfect condition. When that starts to perish, it won't provide a vacuum seal - throw it out. Check the glass too by running your fingers over the top of the jar. If you feel any chips or cracks, throw it out. Your equipment and your ingredients must be in the best condition possible. Once you've checked everything, sterilise the jars. In a saucepan - bring to the boil, then boil for 20 minutes in a large pot with all jars lying on their sides and completely under the water. In the dishwasher - put in the dishwasher on the hot wash. Don't use dishwasher detergent. When the jars are ready to be removed from the sterilising space, pick them up with tongs, a mitt or tea towel, making sure you don't touch the inside - which is now sterile. Do the same with the lids - don't touch the inside. 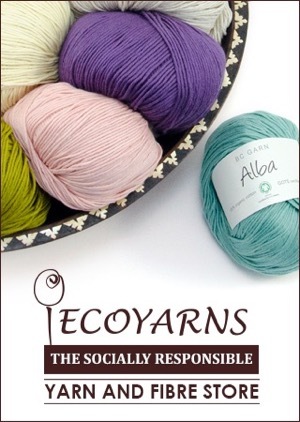 Place them all on the kitchen bench on a board or tea towel. It's important that you have the jars ready to fill and still hot, when the pickling liquid is ready. If you don't have hot jars and hot liquid, you might not get the jars to vacuum seal properly. The day before you make your pickles, wash the cucumbers, skin the onion and cut everything finely. I use a mandolin for this. 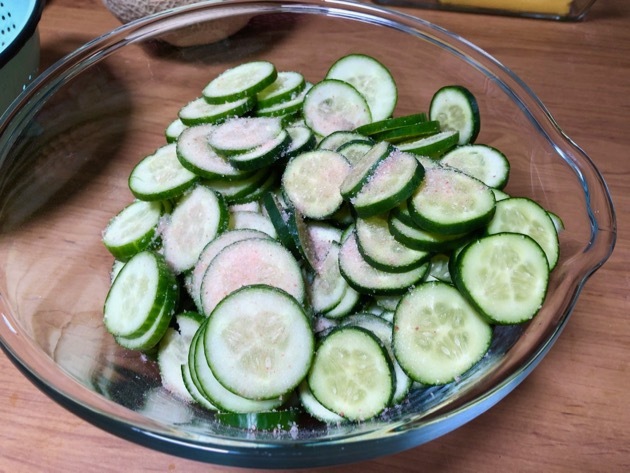 Put the cucumbers and onion in a glass or ceramic bowl, cover with the salt, mix it through with your hands to make sure everything is covered. Cover the bowl and leave overnight. This step is very important. 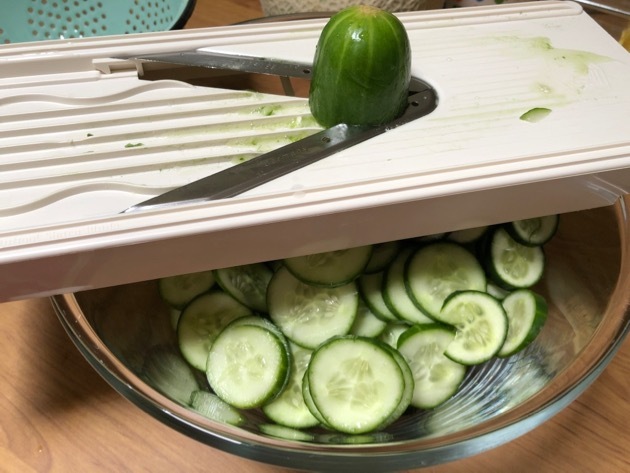 It helps remove a lot of liquid from the cucumbers which if not removed pre-pickling, will release into the jar when you've added your liquid and it will dilute the taste. More importantly, it will probably put out the ratios of sugar and vinegar necessary for a successful and healthy pickle. 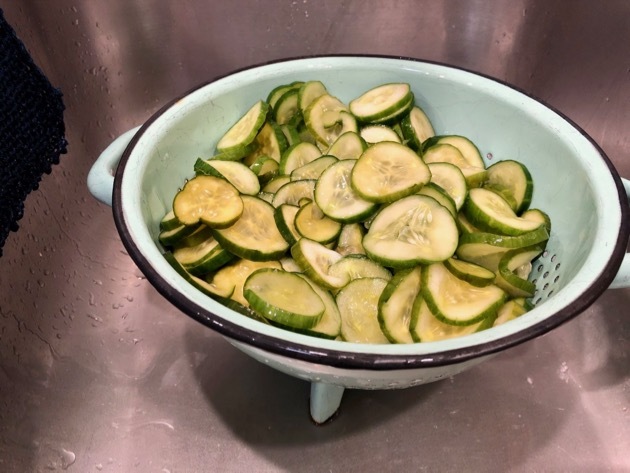 The next morning, pour the cucumbers into a colander and wash the salt off. Make sure you do this properly because excess salt will spoil the pickles. 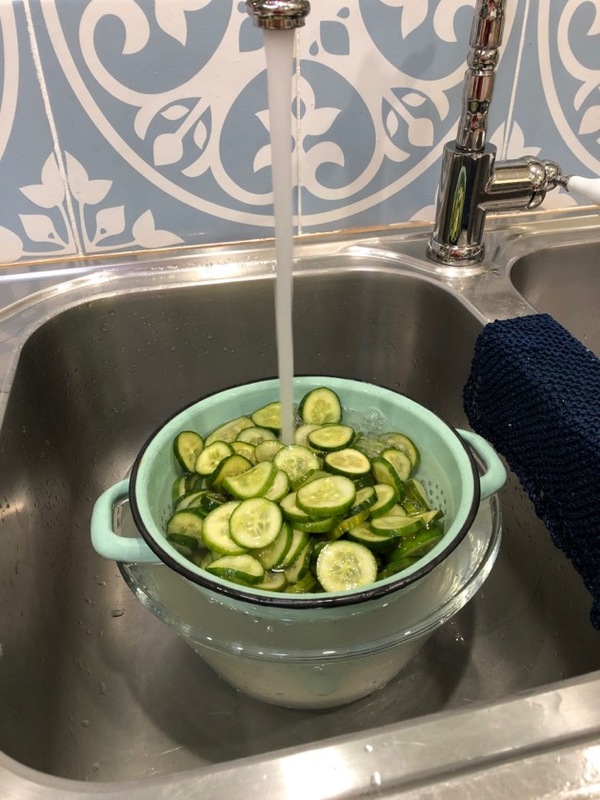 Allow the cucumbers to drain for about an hour, or if you want to carry on immediately, place the cucumbers on a clean tea towel and dry them carefully that way. 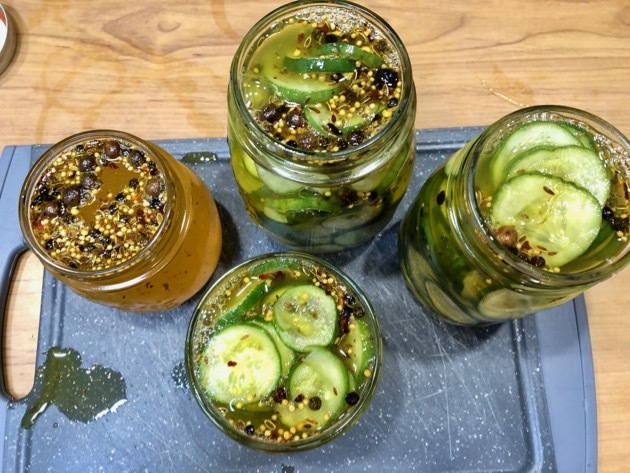 While the cucumbers are draining start preparing your pickling liquid. Remember, the hot jars and the hot pickling liquid must be ready at the same time. 1 - 2 cups/220g white sugar - depending on your taste. 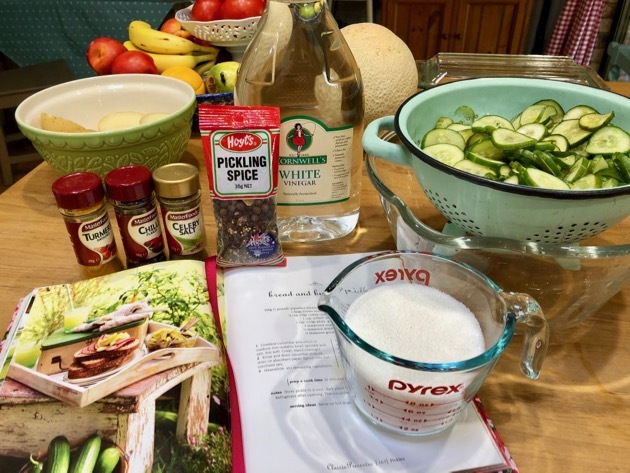 I use 2 cups sugar because I like a slightly sweet pickle and it balances the vinegar nicely. 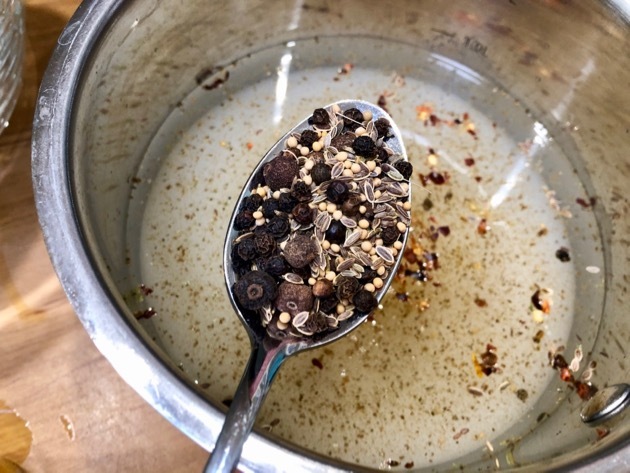 pickling spices - you can either buy pickling spice or use a mix of mustard seeds, peppercorns, celery seeds, dill seeds, allspice berries and bay leaves. Or if you don't like that mix just use mustard seeds, celery seeds, and pepper. I also add chilli flakes and a ¼ teaspoon turmeric. pickling herbs - when I'm growing it in the garden, I add sprigs of dill and I often add a bay leaf to each jar. In a small saucepan, add all the above and bring to the boil. Take it off the heat as soon as it reaches boiling point, don't let it continue to boil. 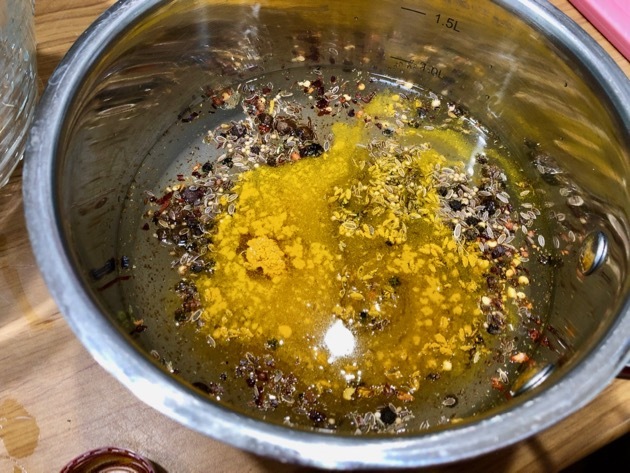 Above are the pickling spices and below you can see the mixture after the turmeric was added. 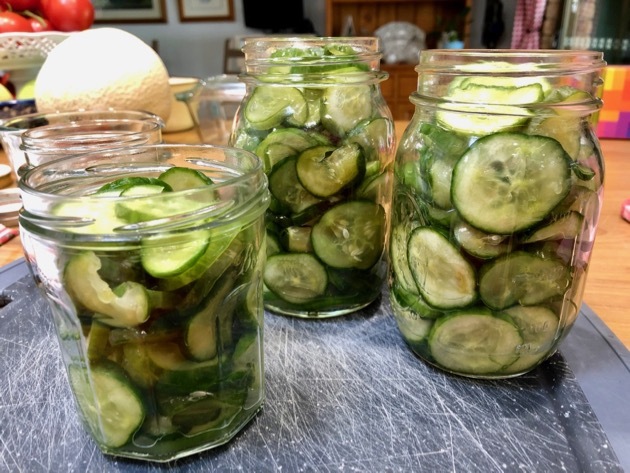 When the cucumbers have drained, using tongs, pack them into the hot jars. Push down gently so you get in as much as possible. Fill all your jars, then pour the pickling liquid into the jars, filling each jar to the top. Put on the lid and secure tightly. As the jars cool, you should hear the lid "pop" when it seals properly. Before you store the jars, push down the centre of the lid and if the lid hasn't sealed you'll be able to press the lid in slightly. If that happens, store the jar in the fridge, not the cupboard. These bread and butter cucumbers will be ready to eat in 2 - 3 weeks. By then the vinegar will have mellowed and balanced out. I store all of my jars in the fridge but many cooks store theirs in a cupboard until they open the jar, and then in the fridge. I have older bread and butter cucumbers that we'll have with cold corned beef and potato salad for today's lunch. It's always satisfying to have follow up jars of any homemade preserves waiting to be used. That is why this is a good first recipe - it's small scale, easy and straight forward. This is one of the most simple preserves you can make. I hope it opens up the world of preserving to you because homemade pickles, jams and bottled fruit will add a new dimension to your cooking. Those pickles look lovely. It's been a long time since I've made bread and butter pickles. It was my first endeavour into preserving vegetables as I'd previously made strawberry jam and apple mint jelly. Maybe next year when I can grow my own cucumbers as the only item I have that has successfully foiled the drought, without using too much water, are the tommy tomatoes. I have 3kg of those set to the side for making tomato relish tomorrow. My Bread and butter recipe is different and currently i have it cut up and salted ready to put into vinegar with spices etc tomorrow . Today i made raspberry jam and strawberry jam. Tomorrow apart from the B and B pickles i am also bottling nectarines and peaches. This is my favourite time of the year with all the preserving i can do. So lovely to have other likeminded folk doing the same. Yes, it's always encouraging knowing others are doing what we're doing. That looks like a great recipe for next summe. 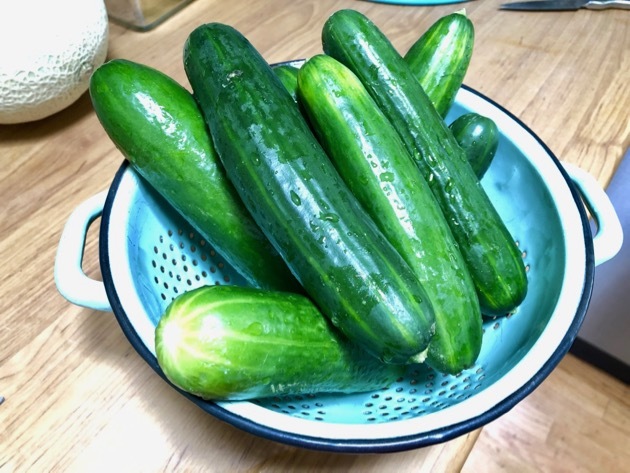 We had far too many cucumbers last year. How long can you store the pickles for please? I've kept some for about 6 months but ours usually go well before that. You must make sure you get a vacuum seal. If so, about 6 months. I made bread and butter pickles for the first time last year and they're now a firm favourite. 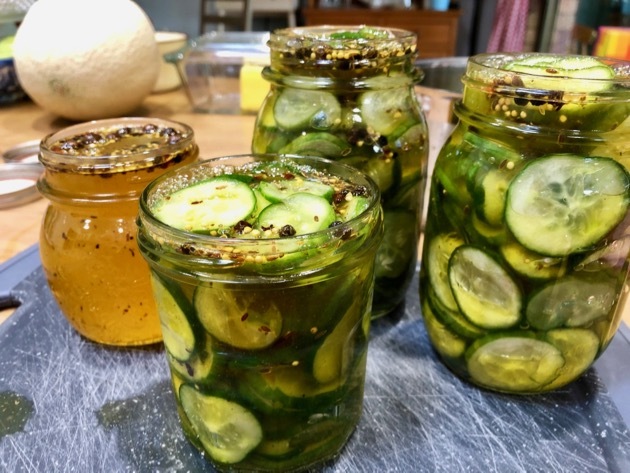 My eldest daughter gets married in June and although she and her fiancee are having a catering company provide the buffet we are going to put out big bowls of homemade pickles/ chutneys including bread and butter pickles. I like your slightly different spice mix. Thank you for the recipe Rhonda. 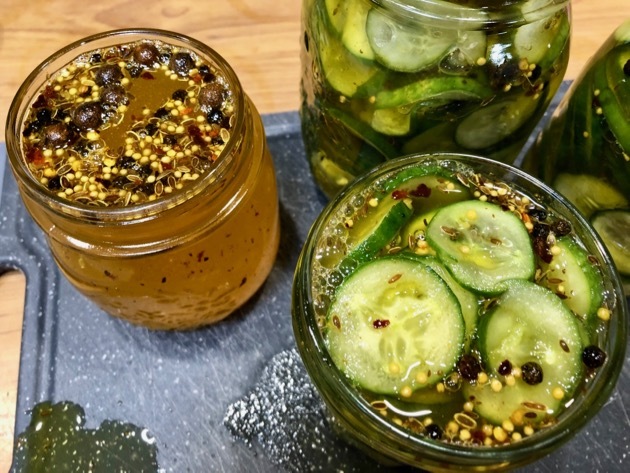 I do quite a bit of preserving, but have never gotten around to making pickles, and I LOVE pickles. This may be just the push I need to try some when the weather cools down. Looks lovely, reminds me of my childhood. My nana would have all manner of things on the go. 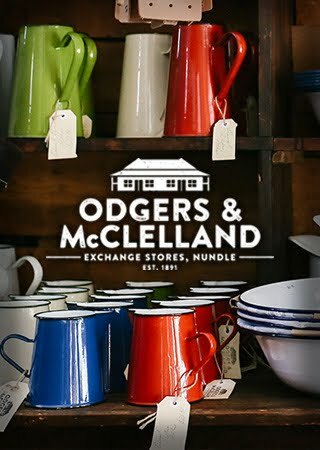 My clearest memory is going to the line cupboard in her bathroom one day to grab a towel and in front of me were shelves and shelves if pickled onions with a few towels of course!! Your preserves look absolutely delicious. I think I would have liked your nana. Would it be okay to use English (seedless) cucumbers for this? I've never used seedless cucumbers but I don't see any reason why they wouldn't work just as well. 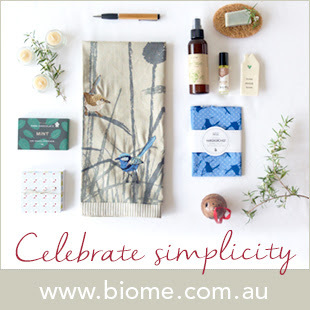 We are finally in our new home in the Tasmanian Central Highlands. I am just loving my kitchen and, in particular my new oven. I am trying to get myself organised to preserve again, I did it years ago. I had great satisfaction in making a small batch of berry jam weeks ago. My hubby bought way too many berries and rather than let them go, I made jam; Strawberry, raspberry and boysenberry. I shot them all in together and cooked, the jam is just delicious and, I had no berries wasted. Thank you for your recipe Rhonda. I tried some this year but didn't salt them overnight, they were ok but I'm sure yours will be better. Next time we grow cucumbers I'll have another try and use your recipe. Love bread and butter pickles. A welcome pickle when my cucumber plant is over producing. We've discovered we can grow cucumbers although they are finished now. This recipe will be useful for the next season we grow them. Thanks Rhonda. I make bread and butter pickles and they are my favourite pickle. In Canada we use your same technique but then we boil the jars in a hot water bath canner for 10 minutes for pints. They keep very well on a shelf for up to 2 years. That's if they're not gobbled up by then! Thanks for this recipe, I will defintely try it out. Here in the UK I still have quite a few home grown cooking apples in storage. I am thinking of trying to make apple butter with them. I haven’t done this before but I thought this would be a good way of preserving them. I was so delighted to see you have returned to your blog. I looked at your blog yesterday on the off-chance after feeling a bit down and needing some inspiration in the home and I was so pleased to see your posts. I have been reading your posts for several years now but have never commented before due to feeling that I don’t have much to contribute. Apple butter would be a great way of preserving the apples. And you'll learn a new skill! My feeling is that everyone has something to contribute. 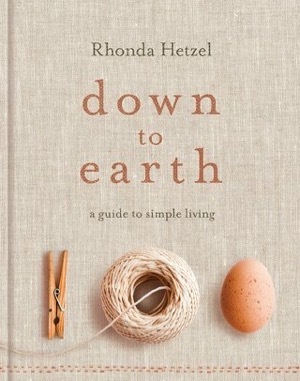 Be it a family recipe, ideas on mending, recycling, baking etc., thoughts on housework or general encouragement and being part of the conversation. Thanks for your comment today. Thanks so much for this post! It really inspires me to add this to my cooking. 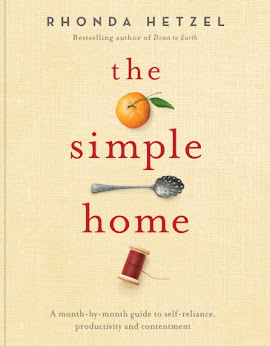 I usually buy but I agree that made-at-home is much better and more suited to your family's taste. I made bread and butter cucumbers the week before last, and last week we had the hottest day ever here - 47.8C. We are surrounded by sea on three sides, and our average temp is normally in the high 20's to low 30's this time of year. Needless to say my cucumber vines got well and truly cooked. 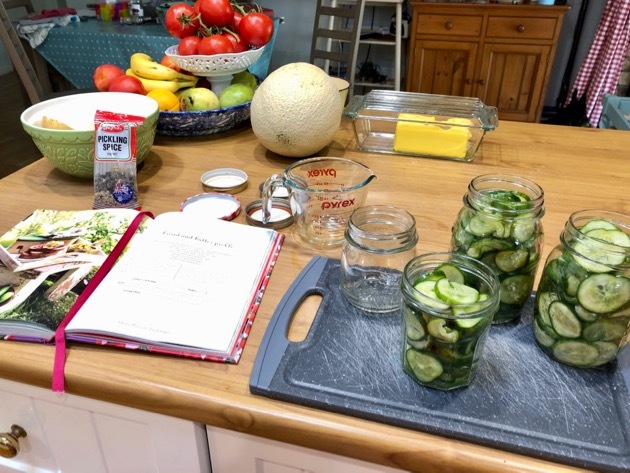 So pleased I had your recipe from years ago and had taken the time to make the pickles the week that I did! Thank you for posting again...tis comforting to come here...and your encouragement is lovely.